It has taken a long time but finally I have finished another icon, this time for a friend who requested one of Mary Magdalene. She has had some issues, something weird happened with the pale olive when she was varnished and her hand seems somewhat large even for being held forward, not to mention in the early stages the gold leaf misbehaved, but all those things add to her character and as I said the recipient is delighted so her she is. 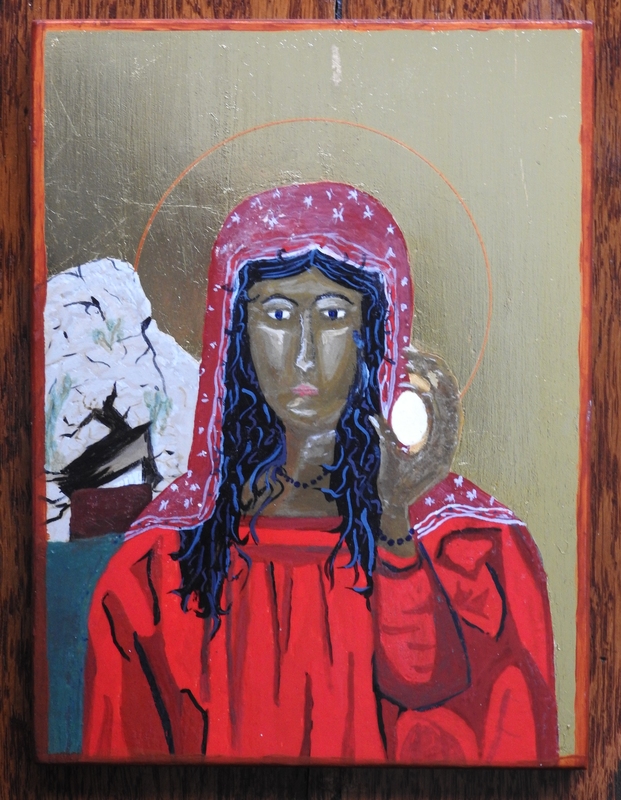 Mary Magdalene holds an egg with the empty tomb behind her representing that she was the first to carry the Good News of new life. Traditionally she is dressed in red and her hair is loose, a throw back to her supposedly dubious past. While I don’t hold to that particular idea I do think it gives her a freedom that the Good News also brings so left her in that traditional way.